"Jehovah Witnesses cost me my family"
For those familiar with Jehovah’s Witnesses, this story is both common and predictable. Notice the outright deception of Dennis Charland, (public affairs director for the Witnesses') who denies this kind of story is true. In fact this kind of story is so common TODAY, that only a liar would try to deny it. But Jehovah’s Witnesses are instructed to lie to "unbelievers" to hide the "truth", so what do you expect Charland to say? We would love Charland to challenge us for libel, so we could bring into court, the huge number of known cases in Canada alone where this has happened. We know first hand of a man who was given an ultimatum: "Try to keep your children out of the kingdom hall and your wife will divorce you." This man was terrified and the story of Arnold Fox below is proof that Jehovah’s Witnesses are a dangerous cult that destroys families. 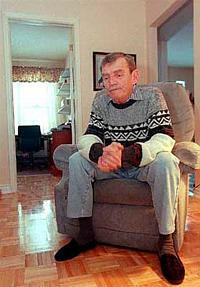 Arnold Fox sits in the living room of his Waverly home. "Church kept kids away - Waverley man"
ARNOLD FOX has kept it bottled up for 25 years. He doesn't want to appear crazy. "People just don't believe that these things take place, and they do," says Fox, 67. The retired Fall River man says the Jehovah's Witnesses had a role in the 1975 disappearance of his wife and two youngest children. Grief-stricken, Fox paid a private investigation company to pursue the family across Canada. But he has never seen them again. It's a startling tale, which Randy Duplak, his lawyer at the time, remembers to this day. "It was an unbelievable scenario that people just wouldn't co-operate, denied knowledge, denied knowing where his wife and children were," says Duplak, now a provincial government lawyer. "It was almost like a spy game you see on a TV movie. You didn't see it in real life." Duplak says he had no reason to doubt Fox's theory, because Fox appeared credible and had been "an insider" - a Witness - until being evicted from the group, or disfellowshipped, two months before his family vanished. Fox says smoking was the reason he was given for being kicked out of the Witness congregation in Dartmouth's Woodlawn area. Smoking is still grounds for being disfellowshipped. Fox had smoked "for a thousand years . . . played the fiddle and drank and all that good stuff" after running away from his Halifax home, and his Jehovah's Witness mother, at age 16. Within five or six years he returned and, on May 11, 1957, he married Catherine Lilley Brecknell in Bethany United Church in Halifax. Influenced by Fox's mother, Catherine converted to the Witnesses. Fox got involved "to a degree," though he says it was half-hearted. Sadly, his wife suffered from mental illness and attempted suicide twice, he says. In 1965, she took their young son Terry and left Arnold, aided in hiding by Witnesses in Toronto, he says. He found her and, "after having to talk to about 16 bloody Witnesses," brought her home. Afterwards, they lived what Fox calls "a roller-coaster ride." According to 1974-75 medical records contained in Fox's legal file, and which he has allowed Duplak to show to The Sunday Herald, the Foxes shared an "unhappy" and even "unhealthy" relationship. Duplak says the medical records were obtained to satisfy lawyers that Catherine wasn't running because Fox was abusive. In 1975, the couple was living on Bella Vista Drive in Dartmouth and had three children - Terry, 17, Daniel about eight, and Coleen, about six. "I'd had enough religion - and that's putting it in very short form - but the last thing I had said was, 'The children shall no longer attend the Kingdom Hall,' " Fox says. He knew that made him vulnerable with the Witnesses, because as the father and an obvious doubter, he could try to override the group's ban on blood transfusions if his children were under medical care. Fox was summoned to the nearby Kingdom Hall to appear before a judicial committee. He went, knowing he was to be disfellowshipped. Using smoking as the grounds "was a ploy. They had to use something. . . . The point is, they couldn't have helped (my wife) away on a permanent basis unless I was disfellowshipped. . . . And two months later, they were gone." On Aug. 24, 1975, Fox returned home with Daniel and discovered his wife had fled with Coleen. On Sept. 15, Daniel "was picked up at school, a ticket was put around his neck and he was put on board a flight to Toronto" to meet his mother, Fox says. He says son Terry, a devout Witness who would soon marry, admitted that he and "others" had taken Daniel to the Halifax airport. This story is contained in Fox's affidavit dated Oct. 28, 1977, which was filed with the courts in the preliminary stages of Fox's child-custody application. The affidavit was also used to access telephone records in the search for the family. Fox later dropped the custody proceeding because he could not locate the children. The Sunday Herald tracked down Terry Fox at his home in Lethbridge, Alta. He is still a Jehovah's Witness. He is hesitant to discuss his father's allegations. But he does not deny Arnold Fox's version of events. He will only say his father is being unfair about the role of Jehovah's Witnesses in the affair. "The family didn't ever split up over religious reasons," says Terry Fox, 41. "It was such a wild situation. It was so odd and all the rest of it. I don't feel able to elaborate and lay the rest of it on the table." Terry Fox says he last spoke with his father in 1977 and "left the ball in Dad's court" as far as future contact. "I haven't heard from him since." An ex-Witness supports Arnold Fox's story, saying he knew the elder who helped take Daniel to the airport. That elder has since died, he says. By the time Daniel disappeared, Fox had already hired Duplak, a young lawyer then with the Dartmouth firm Weldon Misener and Covert. The matter was "the kidnapping of his child, Coleen Heather Fox," Duplak alleged in his Nov. 10, 1977, affidavit filed in the early stages of the child-custody application. Duplak squirreled away Fox's file because the case was so intriguing. Inside are the photographs Fox supplied to help identify his family. One shows a smiling young girl and an older boy standing outside, barefoot and proudly holding a fish between them. Another shows Catherine, with a beehive hairdo and glasses, posing with the two boys near a lake. The third photo is a shot of a young Arnold, Catherine and two of the children huddling against the wind. The loss of the children left Fox "almost out of my mind with grief and sadness." He also feared for their safety because he believed Catherine was suicidal. Fox says police were able to verify that the children were OK, but said they could do nothing further. From November 1975 until October 1976, investigators followed the family from Toronto to various addresses in Victoria, B.C., always coming up short. Fox had learned through a friend in airport security, who is now dead, that the limousine carrying Daniel had gone to a Toronto address, but this was a string of over 100 townhouses. Because Fox wanted the search done quietly to keep the family from bolting, investigators opted against banging on each of those 100-plus doors. In a letter to Duplak dated March 5, 1976, World Investigation Service reported they had noticed a Jehovah's Witness Kingdom Hall near the townhouse development, but "following Sunday services . . . no one resembling the photographs of Mrs. Fox was observed." Duplak says there was little police could do. Fox's file refers to a Dartmouth police investigation running from August 1976 until Feb. 16, 1977. Police concluded Catherine and the children might have moved to the United States. That lead was checked, but the U.S. Consulate in Victoria reported Catherine Fox had not applied for an immigration visa. Fox even speculated that the family had changed its name. In his 1977 affidavit, Duplak stated, "Our investigations show and I do verily believe that Catherine Fox and Coleen Heather Fox (and Daniel Patrick Fox) were transported by members of the Jehovah Witness sect . . . (and) are being harboured and hidden by members of the sect." Today, Duplak still thinks Catherine had help. "Somebody had to be helping them, for whatever reason she might have left," he says. "It was impossible to trace. It was well done. . . . There were no mistakes." Dennis Charland, public affairs director for the Witnesses' governing Watchtower Bible and Tract Society in Canada, says there would be nothing wrong with fellow Witnesses helping a woman who wants to leave her husband. Charland cannot comment on Fox's story, but says, "to suggest that (his family disappeared) because of the church, well, that's heresy. "We have nothing to hide," Charland said from Halton Hills, Ont. In metro, community relations chairman Grant Avery said he does not know the circumstances of Fox's case. "We keep those matters (of disfellowship and membership) very confidential, and the individuals, they know that as well," Avery says. During the three or four years following the disappearance, Fox also hired police officers in British Columbia and Ontario to do private sleuthing for him. He says he spent about $15,000 trying to find his children. "Quite frankly, I would rather deal with the Mafia than deal with that organization," he says with bitterness. Fox moved to Newfoundland, trying to forget. He met Betty, whom he would later marry and have a son with. It was a new life. But when Fox returned to Nova Scotia around 1980, the tragedy hit him all over again. "I folded up for about two months. There were just too many nights I sat in that old La-Z-Boy of mine and cried my eyes out," he says. "I don't care who the man is, unless he's made of granite, it literally tears you apart." In 1983, he started divorce proceedings against Catherine. Not knowing her whereabouts, he had the papers delivered to her sister in P.E.I. He did not hear from Catherine, and the uncontested divorce was granted on June 4, 1984. Fox stated in documents he did not know the children's whereabouts and did not request custody. Last Valentine's Day, his daughter Coleen telephoned out of the blue, and they had an awkward 15-minute conversation. He learned his ex-wife had committed suicide about three years earlier. Coleen said she was calling from Western Canada, that she was married to an older man and had children. Fox assumed she was still a Witness. She promised to write and send photos of the grandchildren he has never seen. She has not contacted him since. "There were a lot of things I would love to ask her. I don't know where all this fear comes from (on her part), because as children ages six and seven, when I came home, they'd come running to me with open arms, and we had a great rapport." Fox has heard that his oldest son is in Alberta, is married and has children. He hasn't tried to contact him again, because "it would be to no avail. He won't speak to me." He has no idea what became of Daniel. This is what was taught 15 years before Fox lost his family because the Watchtower organization allowed them to be kidnapped by their mother.